DAR es SALAAM, Tanzania, April 14, 2014 (ENS) – On a visit to Tanzania, Howard G. Buffett, the elder son of American investor and philanthropist Warren Edward Buffett, Thursday pledged to provide a helicopter for surveillance of poachers in the Selous Game Reserve. Through the Howard G. Buffett Foundation, a private foundation in the United States that he heads, the American billionaire also will support capacity building and anti-poaching efforts in Tanzania through purchase of vehicles, GPS equipment and the training of helicopter pilots and game rangers. 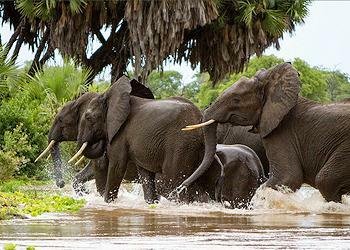 A UNESCO World Heritage Site in southern Tanzania, Selous Game Reserve is one of the largest animal reserves in the world, inhabited by elephants, hippos, Cape buffalo and crocodiles. The helicopter will arrive in Tanzania in about six months, and meanwhile, Buffett will lease a helicopter to begin patrols in mid-May. Minister for Natural Resources and Tourism Lazaro Nyalandu said in a statement that the Ngorongoro Conservation Area Authority will also purchase a helicopter to conduct patrols in the Ngorongoro corridor, Loliondo, Manyara and Tarangire that is large enough to fly with both rangers and police aboard. Working with the ministry, the Howard G. Buffett Foundation has hired two consultants to give advice to the Selous Game Reserves and the Pasiansi Wildlife Training College for six months, the minister said. Visiting the college with Buffett, Nyalandu said the government has announced employment opportunities for 450 game rangers out of 950 it plans to employ during this financial year and will give 25 AK47 rifles to the college for training purposes. The Howard G. Buffett Foundation has a long history of support for conservation in Africa. In South Africa in March, through the foundation and the Nature Conservation Trust, a nonprofit South African trust fully funded by the foundation, Buffett launched a three-year initiative to combat rhino poaching in Kruger National Park in cooperation with South African National Parks. The unprecedented US$23.7 million (RAND 255 million), three-year initiative will combat rhino poaching in Kruger National Park and test anti-poaching tactics that can be applied in other regions of Africa, where poaching can be a source of funding for armed groups. 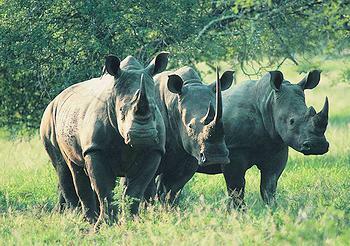 Kruger is inhabited by over 40 percent of the world’s remaining 22,000 rhinos, the largest single population of rhinos in the world. Since January 2010, 1,383 rhinos have been poached from Kruger National Park, part of a larger assault that resulted in 2,368 rhinos poached in South Africa over the past few years. 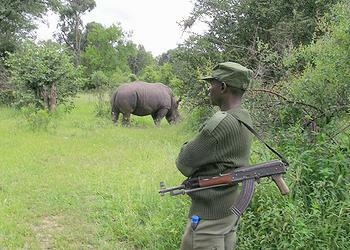 In some areas of Africa, entire populations of rhino have been eliminated. “This effort joins our foundation’s historic support for conservation with our current focus on conflict mitigation in Africa, particularly in the Great Lakes region,” said Buffett. The announcement was made at the Rose Bank office of Standard Bank, which announced its own support for the initiative by providing favorable banking fees and interest on the funds they will hold. With the funds, Kruger National Park will create an Intensive Protection Zone using sophisticated detection and tracking equipment and infrastructure on the ground and in the air. Plans call for elite canine units and highly-trained ranger teams, and improved intelligence gathering and observation and surveillance systems. Kruger’s poaching problem is fueled mainly by illicit criminal networks in Mozambique, South Africa, and East Asia, but evidence suggests that armed groups elsewhere in Africa derive funding from poaching activities in Kruger. “SANParks, thanks to the leadership of David Mabunda, and Kruger National Park, under the direction of General Johan Jooste, provide a unique opportunity to test new technology and new ideas within the best operating national parks system on the continent,” said Buffett, announcing the funding. “More importantly, the lessons we hope to learn and share across SANParks and the continent will, we believe, develop new and more effective ways to combat illicit wildlife trade, particularly where it is financing armed groups,” said Mabunda. The group Leadership for Conservation in Africa, led by its South African-based CEO Chris Marais, will provide advisory and advocacy support for the collaboration. The foundation has committed US$175 million (R1.9 billion) in support of its Africa Great Lakes Peace Initiative, which also includes funding for anti-poaching efforts designed to interrupt the flow of capital to armed groups. Through direct investments and support for the Nature Conservation Trust, the foundation has already committed over US$45 million (R485 million) in South Africa for conservation and agriculture development activities. In Limpopo Province, the foundation created the Jubatus Cheetah Reserve in 2001 and supports cheetah research and regional planning for conservation of the cheetah, the world’s fastest running animal, classed as Vulnerable to extinction by the IUCN Red List of Threatened Species. Founded in 2007 and spanning 9,200 acres in Limpopo Province, Ukulima Farm is owned by the Nature Conservation Trust. Research there develops improved seed varieties suited to different African climates and soils and tests conservation-based production practices for smallholder farmers. Other foundation projects have strengthened environmental governance and preservation of natural resources and supported carnivore research in the Shashe/Limpopo Trans-Frontier Conservation region. 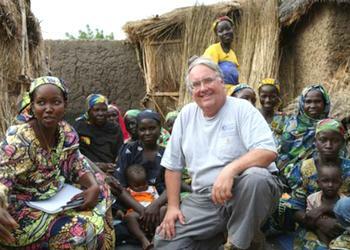 A permanent resident of South Africa since 2007, Howard Buffett grew up in Omaha, Nebraska, and has been active in agriculture, business, conservation, philanthropy, photography, and politics. Buffett serves on the corporate boards of Berkshire Hathaway, Inc., an investment holding company and The Coca Cola Company, the world’s largest beverage company, among others.